The original concept for Airbnb is pretty well known by now: a person rents out their own home over the platform and has the opportunity to earn a bit of money while away. If the concept works with lodging, then why not try it with cars? This is a question that three (former) students of the Technical University of Munich also asked themselves – and founding TripCar was their answer; the self-appointed Airbnb for cars. Driving to the airport with your own car and leaving it in a parking garage for a few days might be convenient – but also expensive. The standard parking fees at the Munich Airport run €19/day. Basically, your car just sits there in a parking spot for days where it takes up space, costs money and is not used. On the whole, it is not very effective. The time has come for an intelligent solution. Much like the one offered by TripCar, the self-appointed Airbnb for cars. 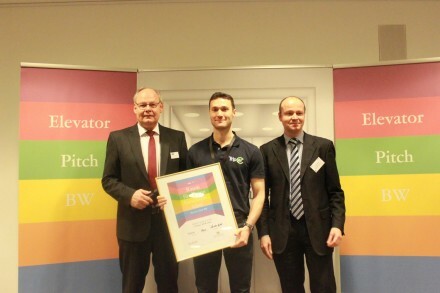 TripCar was started by three young founders who met while studying at the Technical University of Munich: Fabien Rozzi (28), David Gölz (25) and Nilson Silva (32). Together, they participated in a business plan seminar at UnternehmerTUM, which they won with their business idea for an Airbnb for cars. That proved to be motivation enough to follow up on the idea. 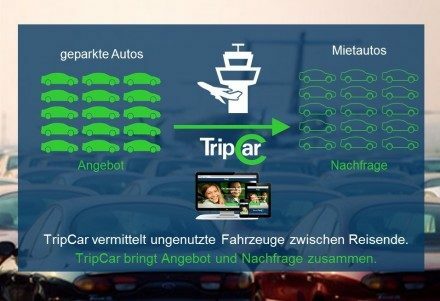 TripCar works like this: customers arrive with their own car and park it at the airport for free. While they are away, they offer their car to other travelers as a rental car on the platform. 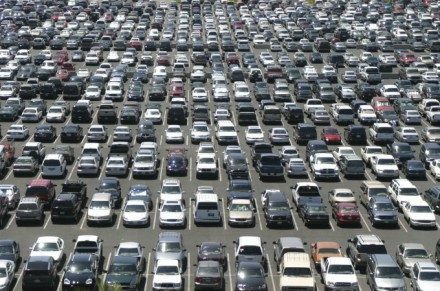 The advantage for car owners: they no longer have to pay expensive parking fees, and can earn a little money while they are gone. The advantage for those renting from TripCar: they pay up to 50% less than for a standard car rental. It sounds like a definite win-win situation. In addition to 100% insurance coverage, TripCar hopes to persuade car owners with their full-coverage service: the entire arrangement is performed on the platform. That includes transportation of the car owner to their terminal, checking the rental agreement, handing over keys and verifying the condition of the car. Every car will also be cleaned for free before being returned to its owner. was Fabien’s confident stance on the matter. TripCar is not currently active on the market, as it is still in the planning stage. The young startup plans to start operating in the beginning of 2017. Until they officially launch, the founders are not holding back with their idea, but are instead actively showcasing it. One of many examples of their persuasive talents is the “Elevator Pitch” in Stuttgart, where they took third place. We look forward to finding out if Germans are prepared to rent out their favorite member of the family — their car — for a short period of time. After all, they are already letting “strangers” stay in their homes — so the odds are looking good.